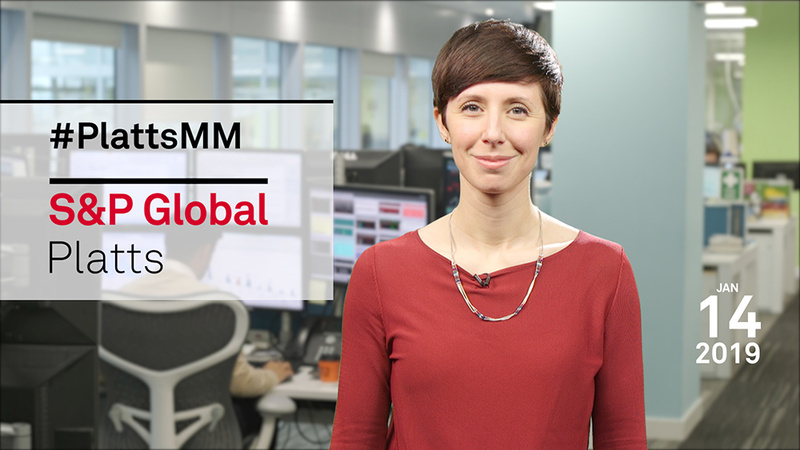 In this week's Market Movers: EU members are due to vote on steel import quotas, while oil markets await data from OPEC and the International Energy Agency to provide signals on output cuts. But first, on Thursday a Dutch court will rule on whether gas production from the giant Groningen field should be halted because of the risk of earthquakes. OPEC and the IEA publish their monthly market reports on Thursday and Friday respectively. Meanwhile, sour crude is set to remain pricey in Europe this week as delays in the Turkish Straits show no signs of easing. In political news, the week's big event will be the UK Parliament's vote on Brexit. UK lawmakers are due to vote Tuesday on whether to ratify the withdrawal agreement negotiated with the EU by Prime Minister Theresa May. Elsewhere, Europe's steel sector is braced for a major policy decision, as EU member states prepare for a Wednesday vote on import quotas. In Germany, the planned phase-out of coal-fired power generation will be on the political agenda, with Angela Merkel set to hold discussions with the coal commission and four state prime ministers from lignite-mining regions. And finally, the approach of the Chinese New Year could boost container freight rates from North Asia this week. In this week's highlights: EU members are due to vote on steel import quotas, while oil markets await data from OPEC and the International Energy Agency to provide signals on output cuts. But first, on Thursday a Dutch court will rule on whether gas production from the giant Groningen field should be halted. The Dutch Council of State, the country's top administrative court, will consider two emergency requests by individuals for production at the giant onshore gas field to be halted immediately because of the risk of earthquakes. Groningen has a quota to produce 19.4 billion cubic metres in the current gas year, shown by the blue line on the chart. Production has been falling steadily in recent years, to meet successive caps. It seems unlikely that the court will force production to be suspended in the height of winter, but the proposal adds to the sentiment of increasing public opposition to gas production in the country. Production figures are also on the minds of oil traders ahead of key data releases. OPEC and the IEA publish their monthly market reports on Thursday and Friday respectively. The market will look to these for guidance on both supply and demand, as output cuts by OPEC and its partners kick in, and global economic confidence shows signs of reviving. The IEA report will be closely watched for any revision to its modest demand growth expectations, of 1.4 million b/d this year, as well as any change in oil stock levels, which have recently moved above the critical five-year average. Meanwhile, sour crude is set to remain pricey in Europe this week as delays in the Turkish Straits show no signs of easing. Larger crude tankers moving from the Black Sea into the Mediterranean are currently waiting an average of 12 days to get through the Turkish Straits and poor weather conditions could see that number rise further. These delays, coupled with a shorter-than-expected Urals loading program out of Novorossiysk, has sent differentials in the Mediterranean to their highest levels since 2013 this month, as you can see here. Renewed sanctions against Iran combined with OPEC's production cuts and the launch of a new refinery in Aliaga mean that anyone looking to buy a spot cargo of sour crude in Europe has had to pay up. MPs are expected to vote against the deal, which will do nothing to lift uncertainty over the UK's future trading relationship with the bloc. It also means continuing questions over the validity of UK-issued carbon allowances. Amid all the noise surrounding the vote, Europe's carbon traders will be watching allowance prices closely. The December 2019 contract edged up on Friday on speculation of a delay to the March 29 deadline for the UK's withdrawal. Staying with politics, Europe's steel sector is braced for a major policy decision, as EU member states prepare for a Wednesday vote on import quotas. The European Commission has proposed to restrict quotas on steel imports to prevent redirection of trade flows after the US hiked tariff last year. The plan, which would allow import tonnages to rise by 5% per year until mid-2021, is expected to gain approval, and implementation is slated for February 4. Given low domestic growth in the vehicles sector, European automakers would prefer to have fewer restrictions on imports, which could work out cheaper than local material. But for German steelmakers the proposals do not go far enough. Companies have seen their markets eroded by growing Turkish imports over the past year. Also in Germany, the planned phase-out of coal-fired power generation will be on the political agenda. Angela Merkel is set to hold discussions with the coal commission and four state prime ministers from lignite-mining regions. Shutting down coal plants could impact up to 110TWh of coal-fired generation by 2030, and time is running out for the commission to make its recommendation. Its report is due February 1. And finally, the approach of the Chinese New Year could boost container freight rates from North Asia this week. European importers are likely to want to secure product before the shutters come down on Chinese infrastructure for the holiday. Rates for North Asia to the UK, PBR 11, have already strengthened significantly in 2019, gaining 27% from $1,300/FEU on the last assessed day of 2018, to $1,650/FEU on Thursday. And there could be a few more strong few weeks on the horizon as some UK-based importers look to secure product ahead of the UK's withdrawal from the European Union.